This can be achived through agent less monitoing, that means we don’t need to do any agent installation on the server but the machine should have RSTAT daemon up and running. Controller communicates with port 111 on the Unix machine and this port is then mapped to the dynamic port on which the rstatd is working. The controller then queries rstatd and all communication takes place through this established UDP socket connection. · It is the way of replacing a hard coded value in the script with a parameter which represents a list of values. · VuGen generates a script that contains the actual values used during recording and during script enhancement phase test engineer has to replace the recorded values with parameters is known as parameterizing the script. · Right click on the value and select “Replace with parameter” where we need to execute with different set of values. · After clicking on properties new window will be opened then click on Edit with notepad button and enter some list of values. Note: After entering values in notepad keep the cursor in new line and save the notepad and close it. · After entering the different set of values we have to customize the parameter properties to execute the script as user’s perspective. These values are used when we have multiple columns in the same table with the same parameter type. We can select for each parameter by number as column number or by name as column name. Column Delimiter drop down has values Comma,Tab,Space which are used to separate multiple columns. First Data Line is a number which it uses that number row data at the time of execution. For eg: if you increase the number to 2 by using up button then the execution starts from 2nd row data. If you select Select Next Row as Sequential and Update Value On as Each iteration then the users will execute the data sequentially for each iteration. Click on close button and press CTRL+L buttons then parameter properties window will open with all parameters in left side and right side parameters data window. 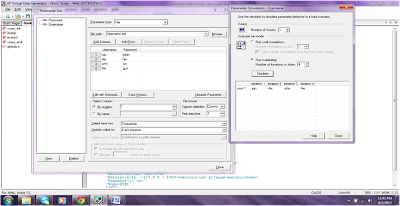 If you click on Simulate Parameter button and then enter the iterations in check box and then click on simulate button then we will get the user behavior when the time of execution how the parameters will pass to the vusers. If you select Update value on as Each Occurrence we can not simulate the parameter. If you select Update value on as Once then the vuser will take only one set of data for all vusers. For ex: In the above snapshot we will get jojo and bean for each and every vuser we execute. For Ex: If we select RandomàEach iteration for Username then we have to select Same line as username for password. If you select Select Next Row as Unique and Update value on as Each Iteration or Each Occurrence then automatically When Out of Values and Allocate Vuser values in the controller will be enabled. If you have values less than vusers at that time we have to select UniqueàEach IterationàAbort Vuser then what ever the users extra are aborted from the execution. And you can click on Simulate Parameter button for each and every different options customized to view how the vuser behavior. If you select Uniqueà Once all the vusers will execute with one set of data. Once parameterization is done click on close button. Test the data execution procedure in the form of iterations in VUGen. 1.How many types of Correlation are there? 2.How you will do the manual Correlation? Replay the script with extended log and look for those boundaries in replay log and Double click in the replay log where the boundaries are found and it will take the cursor to the point where dynamic value is generating in the recorded script. This step is to identify from which request this value is generating and this will help us to identify the location to keep web_reg_save_param function. 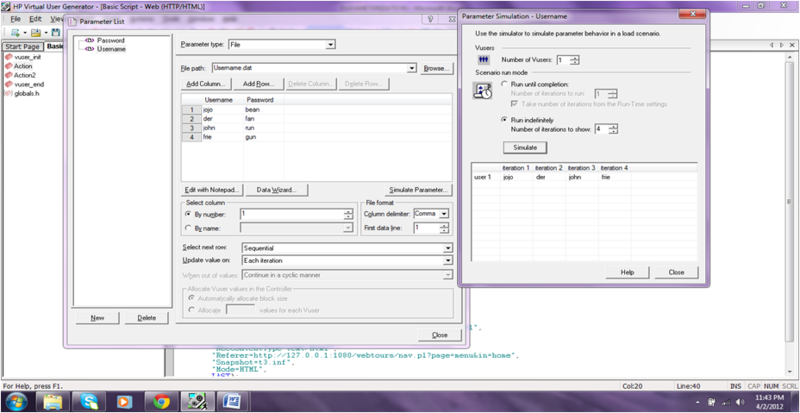 3.How you will do the parameterization for Date/Time? Select the parameter type as Date/Time and select the date/time format in the list. If you want u can get the date in the script by using "lr_save_datetime("Tomorrow is %B %d %Y", DATE_NOW + ONE_DAY, "next"); "
4.How many areas you can do the correlation? 5.What is the function used for to find out the buffer size of file ? First of all we have to know the application type for this question. If it is web application we dont need to go for buffer size bcoz most of the functions are inbuilt with the buffer element. 6.What is the difference between Hits/secs & Throughput? Hits Per Second: This graph shows the number of HTTP requests made by Vusers to the Webserver during each second of the load test scenario run. Throughput:This graph shows the amount of throughput on the server during each second of the load test scenario run. Throughput is measured in bytes or megabytes and represents the amount of data that the Vusers received from the server at any given second. 7.How graph will be there between Hits/secs & Throughput? 8.If suppose we are executing a scenario with 10 vusers and a value is parameterized (Say ex: Sales Id with 10values), how can i know that what is the value of 5th vuser sales id? The question is having little information to answer, Question should also have which parameter properties this scenario is using. Let us go with some examples. If the setting is sales id picked Sequential and update for each iteration. in the first iteration all the users will use first value, so the answer is 5th iteration. If it is Unique the 5th sales id will the 5th user will take. 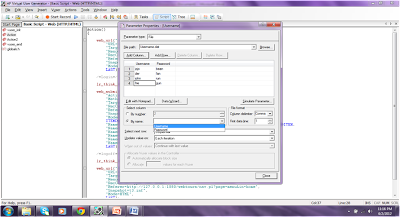 To find 5th vuser value we have to know first what we have give the parameter properties. If we take sequential-->each iteration then in parameter values 5th value is 5th vuser value and if we take unique also same value and if we take random we have to check in the log file of LRR folder. 9.What is the purpose of the Unique value? Assigns a unique sequential value to the parameter for each Vuser. Ensure that there is enough data in the table for all Vusers and their iterations. Ifyou have 25 Vusers and you want to perform 4 iterations, your table must contain at least 100 unique values. If you run out of unique values, VuGen behaves according to the option you select in the When run out of values field. In real life applications, in lot of situations application will not accept duplicate values like order number, registration functionality. 10.In controller, when I am executing the scenario with 10vusers, among 10vusers 1 is failed then how you will find out who is the exact user? First of all enable the ip spoofing and insert "lr_get_vuser_ip()" then execute the scenario and take the log files saved in result directory(.LRR extension) and find the failed user transaction then we can find vuser ip which is failed. 11.Is there any function in lr to avoid multiple login's if a user already logged in? There is no function to avoid multiple logins. In case if we have to avoid multiple login based on our application then we have to write our own code in "C" language. 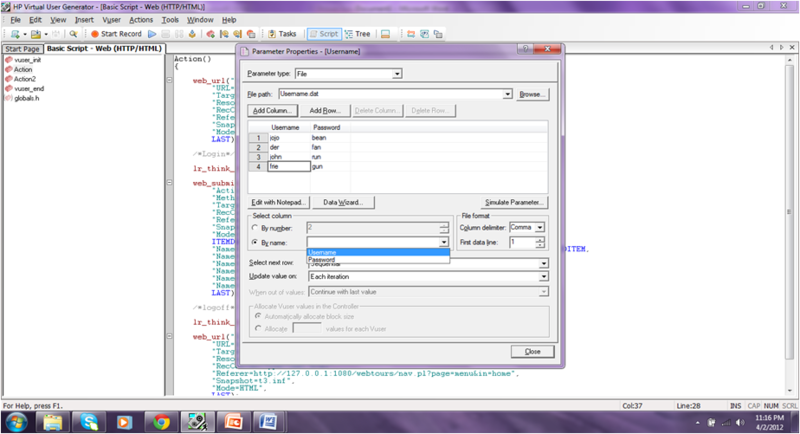 12.In controller I am executing a scenario with 2Vusers and a value is paramerterized ( Say ex: Sales with 10values). So, whether it is possible to assign for each users 5 values? If yes how ?